If you’re considering picking up an Ultrabook, here’s a reason you might possibly want to wait until the next wave of these ultra-thin and lightweight laptops land next year: Super-sharp “retina-quality” displays. VR Zone reports that early next year, when Ultrabooks sporting Intel’s next-generation Ivy Bridge processor arrive, we can expect to see their 13.3-inch and 15.6-inch displays with resolutions as high as 2560 pixels by 1440 pixels. In comparison, the Apple iPad 2's resolution is 1024 pixels by 768 pixels. 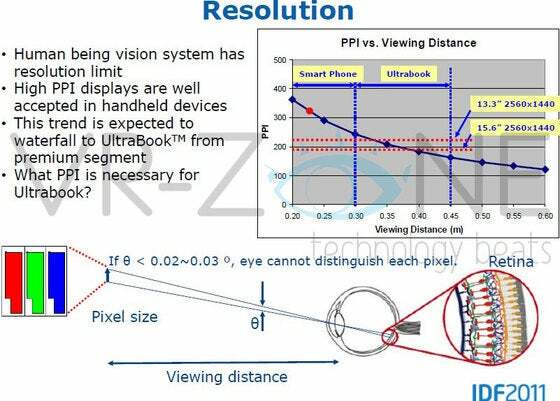 Intel's calculations for smartphone-like display resolutions for Ultrabooks. This graphic shown at the Intel Developer Forum this year suggests Intel is trying to mimic the iPhone’s popular Retina display in offering a screen with such pixel density that the human eye can’t distinguish individual pixels. In other words, Ultrabooks could get smartphone-quality screens. Asus said this week that its 13.3-inch Asus Zenbook UX31 boasts a beautiful high-resolution display (1600 pixels by 900 pixels), which is higher than both the MacBook Air and competing Ultrabook Acer Aspire S3-951. But if a super, super-high-resolution screen is what you want--and you’re willing to pay whatever the price premium that will add on, which is unknown at this time--then you’ve got about a six-month wait for your Ultrabook to arrive.